The Ferrari F430 is the successor to the very famous Ferrari 360. 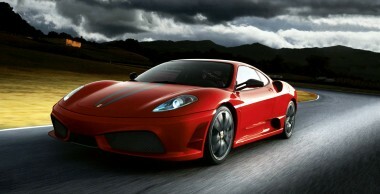 The body styling of the F430 was also revised from the Ferrari 360, to improve its aerodynamic efficiency. Although the drag coefficient remained the same, downforce was greatly enhanced. Despite sharing the same basic Alcoa Aluminium chassis, roof line, doors and glass, the car looked significantly different than the 360. A great deal of Ferrari heritage was included in the exterior design. At the rear, the Enzo’s tail lights and interior vents were added. The F430 features a 4.3L V8 gas engine derived from a shared Ferrari/Maserati design. This new power plant was a significant departure for Ferrari, as all previous Ferrari V8’s were descendants of the Dino racing program of the 1950s. This fifty-year development cycle came to an end with the entirely new 4.3L, the architecture of which is expected to replace the Dino-derived V12 in most other Ferrari cars. The engine’s output specifications are: 490 PS (360 kW; 483 hp) at 8500 rpm and 465 N·m (343 lb·ft) of torque at 5250 rpm, 80% of which is available below 3500rpm. Despite a 20% increase in displacement, engine weight grew by only 4 kg and engine dimensions were decreased, for easier packaging. The F430 has a top speed of 196 mph (315 km/h) and can accelerate from 0 to 62 mph (100 km/h) in 4.0 seconds, 0.3 seconds quicker than the old model.